The Durham Bulls, in conjunction with the Tampa Bay Rays, have announced their preliminary 2014 Opening Day roster. Led by a starting rotation comprised mostly of prospects, and the veteran presence of off-season acquisitions around the diamond, Charlie Montoyo's squad looks to repeat as International League Champions in pursuit of the franchise's fifth Governors' Cup title. For the second consecutive season the Bulls will boast a deep pitching staff, while Montoyo will have to balance six starting pitchers on the Opening Day roster. Leading the staff will be LHP Enny Romero, ranked the No. 4 prospect in the Rays' system by Baseball America. The youngest player on the Bulls roster - who will be just 23 years, 69 days on Opening Day - set a career-high with 11 wins a season ago, going 11-7 with a 2.76 ERA for Double-A Montgomery before late season promotions to both Durham and Tampa Bay. RHP Nathan Karns and RHP Matt Andriese, two newcomers to the organization, will begin the season with the Bulls. Karns, who joined the system in a trade with Washington in February, has gone 24-12 with a 2.66 ERA over three seasons in the minors, while Andriese, acquired in a trade with San Diego in January, has posted a 26-16 mark over three seasons with a 3.18 ERA. LHP Mike Montgomery, a first round pick of Kansas City in 2008, returns to Durham for his second straight season. The California native, traded to Tampa Bay in the December 2012 blockbuster deal that sent James Shields and Wade Davis to Kansas City, was 7-8 with a 4.72 ERA in 20 appearances for the Bulls in 2013. Also returning to the Bulls is RHP Merrill Kelly, a mid-season call-up from Montgomery a season ago. The 2010 draft pick went 8-4 with a 3.19 ERA in 15 games with the Bulls in 2013. The final starter on Durham's roster is 10-year Major League veteran LHP Erik Bedard. Signed by the Rays mid-February, Bedard was granted his release March 25, but resigned with the team March 28. The Ontario native was 4-12 with a 4.59 ERA in 32 games for Houston a season ago and has not pitched in the Minors since a rehab stint in 2010. Anchoring the bullpen will be the 2013 Tampa Bay Minor League Relief Pitcher of the Year RHP Kirby Yates. After going 20-for-23 in save opportunities last season with the Bulls, the Hawaiian will open as the team's closer once again. LHP C.J. 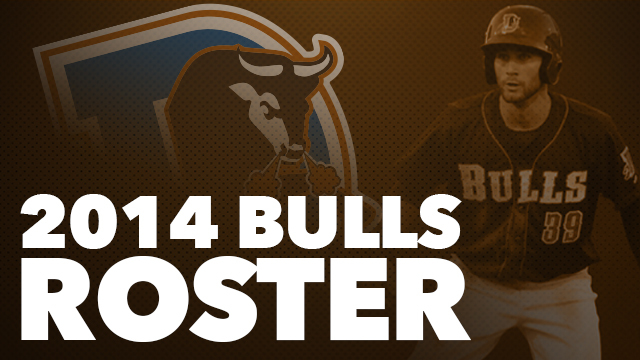 Riefenhauser, the lone reliever named to Baseball America's Minor League All-Star Team in 2013, returns to the Bulls after splitting last season between Montgomery and Durham. Newcomer RHP Brad Boxberger should also be a strong option out of the bullpen, as the 25-year-old acquired from San Diego in January has posted a 2.72 ERA over 42 MLB games in the past two seasons. Rounding out the bullpen will be Durham returnees LHP Jeff Beliveau, RHP Steve Geltz, LHP Adam Liberatore and RHP Juan Sandoval. Behind the dish the Bulls will rely on a duo of veterans to handle the promising pitching staff, turning to newcomers Ali Solis and Eddy Rodriguez. Both began their careers in 2006 and were both members of the San Diego system in 2011 and 2012. Around the infield the Bulls will mix young talent with veterans who possess significant Major League experience. 2013 I.L. Midseason and Postseason All-Star Vince Belnome returns, as does former Florida Gator Cole Figueroa. Robby Price, who spent the entire 2013 season in Montgomery, opens the season at the Triple-A level for the first time in his career. Three veterans, two of which are returnees, round out the infield as Ray Olmedo, Mike Fontenot and Wilson Betemit open the season with the Bulls. Olmedo, a member of the Bulls infield in both 2009 and 2011, returns with 10 seasons of IL experience under his belt. Fontenot, who spent all of 2013 with Durham, opened 2014 in Spring Training with Washington, but signed a minor league deal with Tampa Bay March 28. Betemit, who has accrued the most Major League service time of any position player on the roster (8 years, 107 days) played in just 24 games in 2013 in the Baltimore system because of a torn PCL suffered in Spring Training. The outfield will consist of two homegrown talents in Kevin Kiermaier and Mikie Mahtook, each named 2013 Southern League Midseason All-Stars with Montgomery. Kiermaier, ranked the No. 10 prospect, the Best Defensive Outfielder and the Best Outfield Arm in the Tampa Bay system by Baseball America, appeared in 39 games for the Bulls last season before making his Major League debut in Game 163 against Texas. Mahtook, the 31st overall pick in the 2011 draft out of Louisiana State University, embarks upon just his third season of professional baseball. Local product Jerry Sands will play a corner outfield role and bring with him 128 home runs in 579 career Minor League games. The graduate of Smithfield-Selma High School was claimed off waivers by Tampa Bay in December, following a season in the Pittsburgh system spent at Triple-A Indianapolis. Justin Christian, a three-time MiLB.com Organization All-Star (2010-2012), has appeared in 76 Major League games between New York (AL) and San Francisco. Two players will begin the year on Durham's Disabled List. Infielder Hak-Ju Lee will return to the Bulls after missing a majority of the 2013 season with a ligament tear in his left knee. The South Korean enters the season as the Rays' No. 2 prospect. Outfielder James Darnell will also begin 2014 on the sidelines after being signed as a Minor League free agent in the offseason. The former San Diego farmhand appeared in just 15 games for Triple-A Tucson last year due to a shoulder injury. Pitching Coach Neil Allen returns for his fourth season with the club, while Hitting Coach Dave Myers returns for his sixth campaign. They are joined by third-year Athletic Trainer Mike Sandoval and first-year Strength and Conditioning Coach Bryan King. The Durham Bulls open their 2014 International League season on Thursday, April 3 at the newly renovated Durham Bulls Athletic Park against the Gwinnett Braves at 6:05 p.m. Tickets for all regular season home games are available here at durhambulls.com, by phone at 919.956.BULL, or at the DBAP box office.